Provide comfort for the family of Ronald Arthur with a meaningful gesture of sympathy. 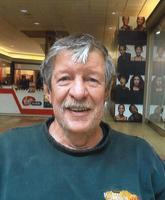 ARTHUR- Mr. Ronald “Bink” Arthur age 74 years resident of Thunder Bay passed away March 19, 2019 in Thunder Bay Regional Hospital after a short illness. Ron was employed at Provincial Papers and later obtained his plumbers accreditation and worked at numerous jobs around the city. Ron always had a keen interest in antique cars and owned many cars and enjoyed taking in car shows in the area. Buying and fixing up anything on wheels and selling them so he could buy more. He worked on many bus conversions throughout his life, starting with an old 50’s school bus in his twenties and finishing with a greyhound bus conversion. His youth was spent at Cedar Bay enjoying water skiing and boating on Lake Superior. He had a special love for all dogs, his Kimmy growing up and his latest furry friend. Ron had a great sense of humour and always enjoyed a good laugh with his many friends. To quote Ron “choice” or “I’m just saying”. Ron is survived by his daughter Susan, stepson Patrick, his special friend Gabrielle Beaupre, brother Doug (Brenda), nephew Darryl, nieces Christine (Ed) and Jane (Steve), Aunt Marg cousins Terry, Sue (Fred) aunt Mitzi and family. Predeceased by wife Trudy, parents Joseph and Dorothy, aunts Francis (Tooty) and Hazel, uncles Ted, Sam and Roy Arthur and Jack and Don Marshall. The family will have a memorial service for Ron at Grace Evangelical Free Church, 289 North Court Street on April 13, 2019 at 10:30 a.m. Lunch to follow at the church. A private interment will follow at a later date. In leu of flowers memorial donations can be made to the Humane Society or Grace Evangelical Free Church. On-line condolences may be made at www.sargentandson.com. To send flowers in memory of Ronald Joseph Arthur, please visit our Heartfelt Sympathies Store. Provide comfort for the family of Ronald Joseph Arthur by sending flowers. Bink, Marlene and I will long remember our chats and laughter at the Italian festival .. You would recount your stays in Bucerias, Mexico with us. A prayer goes out to your family. Rest peacefully Bink.